Knitting and Fishing – Ellen Hutson Bloghop! Hello, and welcome to the Late Summer 2016 Essentials by Ellen Release Hop! You should be arriving from Lisa’s blog – if not, then pop over to the start of the hop at The CLASSroom! I’ll be showcasing several of the new stamp sets – in TWO videos – on my post today! (Since there are two videos today, I’ve only got one more video coming this week – on Friday.) Scroll down for giveaway info and for the supply lists are below each video. Sock Monkey has a bunny friend. And balloons! I looked up the monkeys on Google to check the coloration, and the monkeys are kind of a brown-grey color….so I used both. You could also swap the order – grey color on the monkey with brown lines. Either will create that mottled knitted effect! Watch the video below or click HERE to watch in HD on YouTube. Below are links to the supplies I’ve used for today’s project; compensated affiliate links may used, which means if you make a purchase I receive a small commission at no extra cost to you. I truly appreciate your support toward the costs of running this blog! Read more. For my second card, I decided it was time to get out distress markers – I haven’t used them in a while! I combined a few techniques here, both straight-up coloring as well as scribbling on the stamps for the background images to make them look like they’re in the distance! Watch the video below or click HERE to see it in HD on YouTube. Hooray!!! I also get to give away an Essentials by Ellen stamp set! note: if you’re not able to leave a comment for the giveaway, leave comments on YT and I’ll pick from those too. The winner may chose ANY Essentials by Ellen brand stamp set (Maximum value $25 USD) currently in stock at Ellen Hutson.com To enter my giveaway, please leave a comment on today’s post by Tuesday, August 23rd! ALL winners will be announced at the CLASSroom on Friday, August 26th! Please check there on that date to see if you are a winner and for further details on claiming your prize! If you get lost along the hop, please visit the CLASSroom blog for a complete list of all the designers. Your next stop is the amazing Teri Anderson! Adorable cards! Such great coloring techniques. Your coloring amazes me~~ it makes me want to color, though I know it won’t be even half as good, haha~ but you do inspire me to practice old techniques and try new techniques. Wonderful inspiration from you always. You are so creative. Just love your bear card. Too cute. Super cute cards. And the coloring is just perfect. Just love your adorable cards. Mr. Bear goes to the ocean is adorbs! Love the scene you created. This release is awesome. 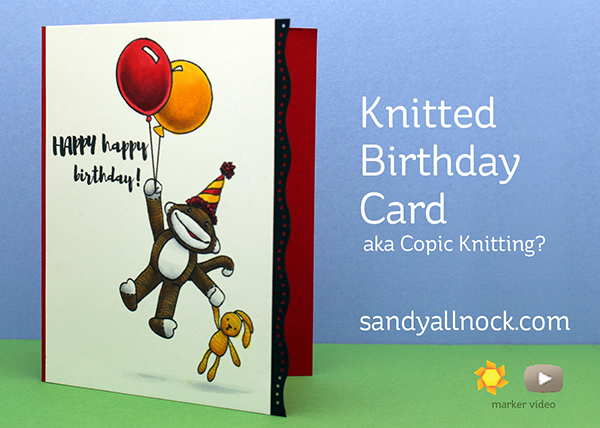 Luv your cards, Sandy! I don’t use copics but I love watching you color with them. What adorable cards! I am so happy to see the accessories for the bear (and sock monkey)– especially the cute bunny! Thanks for sharing your coloring techniques! Oh that monkey is sooo cool! Definitely fit for the year of the monkey and you make it look just like my neighbor girl’s sock monkey (made from a real sock). I love the bears, too. Thanks for always brightening my day, Sandy! Sandy, Your work is amazing. The coloring is beautiful. What fun cards. Thanks so much for sharing. The Bear Ware is too cute, love that card, fishing pole and all! It was interesting to see you do the coloring. I have enjoyed your other YouTube card making videos also. You are wonderful. I always learn so much watching your videos!! Your sock monkey is just precious! I can’t believe how realistic that sock monkey is. Great cards. I could watch your videos all day long. I am amazed! I especially love the sock monkey! You are one talented artist! Love your creative style! As always your cards are wonderful and inspirational. Thanks for sharing your talent! I can’t believe how you colored it to look like the monkey was crocheted. Amazing! OMG!! 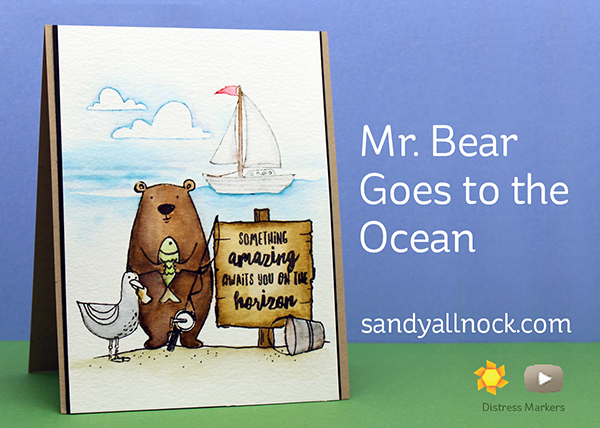 Your sock monkey card was so super cute but I was blown away by your Mr Bear Goes to the Ocean card!! You are just too crazy talented!! I could sit and watch you color in whatever medium you are using all day long!! I learn so much from your videos. I love the Mondo Peony and Sock Monkey Surprise, it’s hard to choose between those two 🙂 I currently have 5 stamps on my wish list since the new release from Julie Ebersole. Love your videos and talent. Sandy – you picked my 2 favorites for your “bear card”! Just love the Stay Salty set, and how can you not want accessories for Mr. Bear? His little smile is just too funny. I’m not a fan of monkeys, sorry to say, but I did enjoy watching you color the sock & bunny with your trusty Copics! You always do such lovely work! I like the technique using the sailboat and the clouds. Your card is adorable!! The sock monkey stamp set is so cute!! Amazing cards Sandy. Thanks for the inspiration. Wow what a cool technic! I can’t wait to try something like this! Thanks for sharing! How can one NOT love the Sock Monkey? He is so cute! Watching you create is so soothing! Love both of these cards! Great Essentials by Ellen release! The bear going to the ocean is adorable! Love the cards you’ve made! Your work is so inspiring! Love the cards you made! Thank you for sharing. I absolutely love your tutorials, especially the knit this week. Your cards are truly amazing. Lovely cards!! Great new release!! I love the sock monkey! Incredible cards! I love the texture of the sock monkey and bunny. Very good job and thanks for the tips. I always learn so much from your videos! The bear card is my favorite. Because of you I purchased the bear stamp set and die. The scene on the card was awesome! Great ideas. Julie really does come out with great stamp sets, doesn’t she? Thanks again, Sandy for all you do. Your cards are amazing. This release is so fun. I enjoy watching you copic colouring. Your cards are so adorable. What a great release. Thanks for sharing. Mr bear is so adorable. Love the videos! I really loved both of the bear and the monkey. I just started using Copic/Distress markers and I simply love them! I can’t wait to try some of your techniques that you used on these cards. Thanks for sharing. I love watching you color and making your scenes come to life. Your monkey and bear are adorable!